Productinformatie "Octopus NET MC-A (12/08) - Multicast IP Streaming Server"
The ideal solution for hotels, bars, offices and everywhere LiveTV streaming to be distributed to many clients. 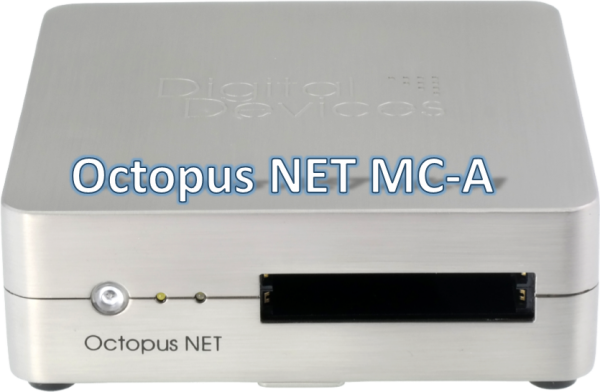 The Octopus NET MC is a pure Multicast Edition of the Digital Devices Octopus NET. The conversion of DVB-C/C2/T/T2 modulated transponders is carried to IP-based in RTP and/or UDP format. Up to 12 TV channels from max. 8 transponders can be implemented per server (8x DVB-C/C2/T/T2) . For a higher conversion of channels, several Octopus NET MC models can be cascaded. The streaming of individual TV channels is done here in the SPTS (Single Program Transport Stream) method, which provides a wide compatibility with hardware and software clients. By the integrated CI interfaces, a direct decryption from TV channels is possible. Several channels of a transponder can be decrypted* per CI slot. The configuration is carried out exclusively by a password protected web interface, which prevents the unauthorized access to the configuration. The multicast IP address as well port and protocol (RTP / UDP) are freely definable. The integrated 5-port Gigabit Switch provides a stable transmission in the network and enough capacity for streaming. In addition, the IGMPv3 protocol is supported. *Please note here the license terms of providers and content providers. Please note that the Octopus NET MC-A no distribution via unicast (RTSP) provides, such as those is defined by the SAT>IP protocol. For this purpose distribution, please use the Octopus NET v2 versions. It can not be used with clients, like set-top boxes for SAT>IP unless they support the multicast method. Verdere links naar "Octopus NET MC-A (12/08) - Multicast IP Streaming Server"